Puppy mill survivors adapt to family life with time and patience. Make sure you have some of each before you decide to adopt one! How do you deal with a dog with "issues"? How do you deal with an untrained adult dog? Most dogs want to please their owners/family and want their companionship. Even though puppy mill dogs have never experienced the love between pet and human, they will respond to a warm and comforting environment. You will be rewarded on a daily basis to see just how responsive they can be to your love although it may take several weeks up to much longer for your dog to be fully socialized. The information given here is designed to give you some guidance and is not an “iron clad” set of rules. Each puppy mill rescue dog is different. Some come to you from foster homes where someone has already worked with them a bit, others may come to you straight from the mill, and will therefore need more help and time to adjust. Try to ally the fears of a puppy mill dog. This is the most difficult part. Do not approach the dog head on. That can appear threatening to the dog. Try walking sideways to pick her up. Coax her to you with a treat she likes. Also be aware that she will be sensitive to new things, sudden sounds, doors opening and closing, new people. Love her. That is the most important thing that a rescued puppy mill dog needs. She needs to feel that she is in a safe place with her forever family. She will love you back unconditionally. She will bring you joy. NEVER let your dog loose outside as puppy mill dogs take a while to bond and feel safe with you. If they get away before this happens, they will choose to starve over coming back to you voluntarily. Also be aware that until they have bonded with you, they may bolt out doors that are opened to the outside. We strongly recommend that until you feel this is not an issue, that you use a “drag leash” - this is simply a long leash that makes it easier for you to catch your dog, should they get loose. House train your puppy mill dog the way you would house train any dog or puppy. We recommend crate training as puppy mill dogs are used to being confined. At night, and during periods of more than several hours that your dog will be unattended, place your pup in a properly sized crate (not too big, but big enough for her to turn around in). As soon as you get home or get up in the morning, remove your pup from the crate and take her outside. It is recommended that you pick up your dog’s feces immediately after she alleviates herself. This will eliminate the possibility of her eating her own feces. Coprophagia, (the consumption of feces), can be the unfortunate end result of being underfed and sharing an inadequate food supply with the other dogs in the crate. Sometimes, because they were starving, puppy mill dogs have resorted to coprophagia to stay alive. Feed your dog on a regular schedule. She will come to expect her meals at those times. She will also expect to go out once house trained, right after those meals!!!! Expect that your new dog will not know how to go for walks or walk on a leash. They will most likely be afraid of every noise they hear while on a walk. Just be patient and keep taking her out. Take them out to the same area many times. He/she will then be more comfortable with the walk and look forward to it. Be sure to take her out as much as you can or on a regular schedule. Once you feel your newest member of the family is comfortable and secure in their new home, take them with you when you go out as much as you can. Occupy your new dog if you will not be home for any period of time. Make sure she has her own space and/or bed and toys. She may not know how to play with her toys. Time and patience will help her acclimate to play. 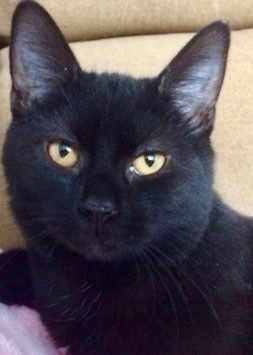 Gene is a 7 month old kitten rescued from a high-kill shelter in North Carolina. Sweet as can be and loves to cuddle! Gene is great with other cats and dogs too! Please support us. Click here to donate to Second Chance Animal Rescue. Or buy a bag of 5 star dog food. The mattes around Carly’s upper legs were so thick that her movement was restricted. She was covered with sores and fleas. This is the condition of most of the dogs that Second Chance picks up directly from the puppy mills. Carly went to the groomer her very first day in Connecticut. A beautiful and sweet dog could now be embraced. The Cussen family adopted Carly two weeks later. She now lives in New Milford with them.